For ‘Murica Monday, here is a car that is not only American in origin, but in execution and in style. Here we have what is the most widely known progenitor of the muscle car genre - the Pontiac GTO. Of course, everybody knows the origins of the Pontiac GTO as a special package on the 1964 Tempest conceived by one John Z. DeLorean, so I won’t go into that here. 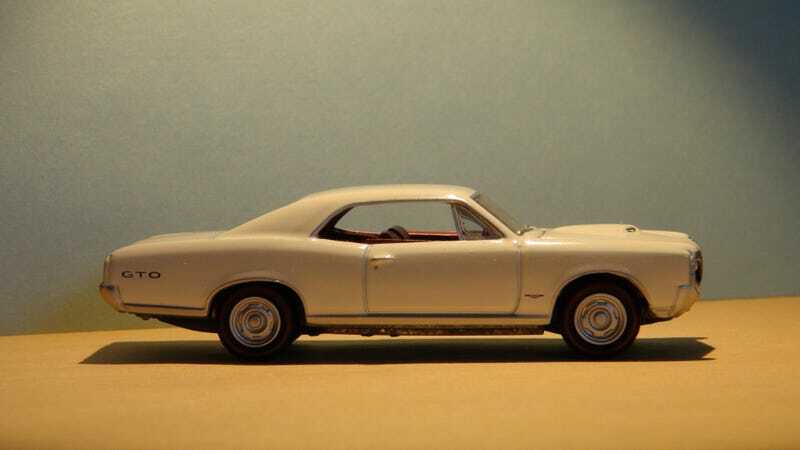 For 1966, the year of that this cast depicts, the GTO underwent a few changes.This was the first year in which the GTO was a separate model, and not just an option package under the Tempest. A pillared coupe, pillarless hardtop, and convertible were offered. Stylistically, it gained a set of coke-bottle curves, which originally showed up on GM’s 1965 full-size lineup. The cast here is a 1966 Pontiac GTO by Johnny Lightning, released under Release 10 of the Muscle Cars U.S.A. series. It has smooth off-white paint, interior detail, full tampos, an opening hood, and a detailed undercarriage. The V8 under the hood is painted in light blue, crowned with three carburetors under the open hood scoop. I believe I got this car years ago when I was younger from an uncle. I’m glad I didn’t open it then, as I probably would’ve damaged it. I only opened it a few weeks ago, and I’m glad I did. This one also has all the original packaging. Interestingly, JL claimed that this was the hobby’s first resealable packaging.